The 1100-metre Bloodstock.com.au Galaxy takes place this weekend at Rosehill, race 6 of a jam-packed day of racing at the racecourse. The early lines of betting have been competitive for the $400,000 race, with five horse likely to enter the race with prices hovering below the double digits. Josh Pride’s Rain Affair and Anthony Cummings’ Villa Verde lead the pack in the bookies’ quarters at this stage, with Kencella, Temple Of Doom and Sessions not too far behind in the punters’ consideration. The best place to have a bet on the 2014 Galaxy is with Bet365.com. The odds below were taken from the site, and you will be able to find the latest race odds there as well. Bet365.com is also offering each-way betting on the race, with which you will receive 1/4 if should your selection place in positions one to three. Cummings’ sprinter was back to his best with a Group 2 win over 1000 metres at Randwick last time out, and will be looking to continue that winning form as he steps up a class. That race was a good indicator with regard to the form of many of the main contenders for Saturday’s race, and seemed to serve as a dress rehearsal for the Galaxy, with Famous Seamus and Bel Sprinter finishing in third and fourth respectively that day, followed by Sessions in sixth and Temple Of Doom eighth. John O’Shea, poised to make his switch to the Darley operation at the end of the Spring Racing season leads his Kencella into the race fresh from a win in a Group 3 race over 1100 metres on the same track and looking to make a significant step up for Saturday’s race. With the weather expected to play up over the weekend at Rosehill, it will be important to keep an eye out for the stronger wet-track runners, with both Sessions and Rain Affair both proving their abilities on a heavy track in the past. Rain Affair has the added advantage of having previously won on the track and over the same distance, and, starting from favourite in gate 5, Pride will be confident of his charge’s chances of repeating victory this weekend. As mentioned above, the best racebook to place a bet on the 2014 Galaxy is Bet365.com, who will offer the best odds on the race. When visiting Bet365.com, click on ‘Horse Racing’ in the left sidebar and scroll down to the Antepost section of the page, where you will find the markets for this race and many more. 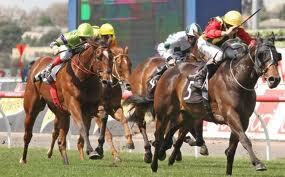 The Bloodstock.com.au Galaxy is a 1100-metre race with a purse of $400,000 run at Rosehill Racecourse in Sydney. Check out the official Rosehill website to keep up with the event.